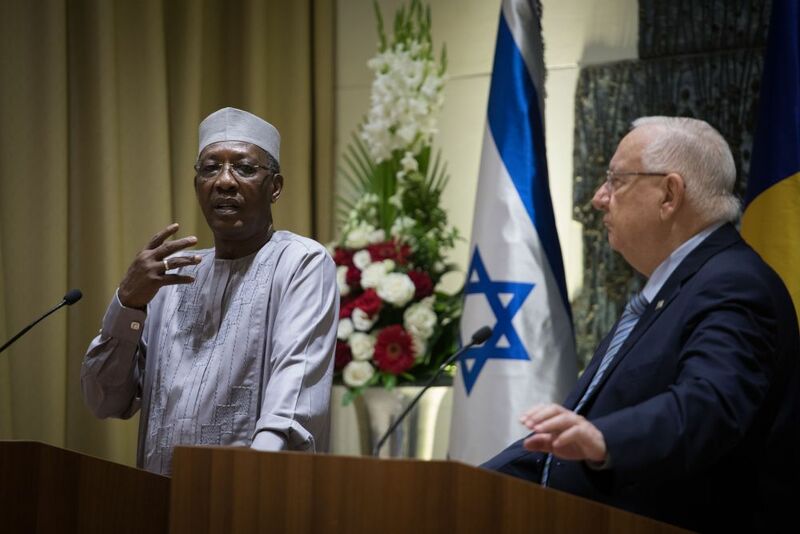 Chad President Idriss Deby arrived in Israel on Sunday, Nov. 25, for a down-to-earth mission. To enlist Israel’s participation in the fierce wars against Al Qaeda and ISIS that are raging across the African continent, and in which the US and France are also involved. This is reported by DEBKAfile. So while Israel celebrated the diplomatic breakthrough marked by the first visit by a Chad president and the burgeoning diplomatic ties Prime Minister Binyamin Netanyahu is developing with the Muslim world, Jerusalem is on the horns of a dilemma on whether to accede to the visitor’s bid. Deby will spend most of his two-day visit in an attempt to convince Israel to lend a hand in the bitter wars African regimes are waging to fend off the inroads the ISIS and al-Qaeda groups are making in their countries, And if Israel agrees, on what scale? Southern Libya, mainly in the oil-rich Fasen region from which a network of pipelines carries Libyan oil to its Mediterranean export ports. As the backbone of the Multinational Joint Task Force (MNJTF), through which Nigeria, Chad, the Central African Republic and others are fighting Boko Haram. On this front, Chad troops have US military backing. The Chad army is also part of another organization dedicated to combating Islamist incursions: The Joint Force of the G5 Sahel (Force Conjointe du G5 Sahel) J5S, which is battling Al Qaeda in the Maghreb (AQIM) in the Sahel desert. According to our sources, Washington is in favor of Israel assisting Chad in its counter-Islamist wars, but France, which is deeply immersed in Chad and the Francophone African countries politically and militarily, was not averse to President Deby’s visit to Jerusalem, but looks askance at its possible military intervention in the wars on Islamist terror. Kenya’s President Uhuru Kenyatta, in contrast, would be glad to see this happen. Israel is already assisting Kenya in its counter-terror war against al-Shabaab in Somalia. The historic visit by Chad’s president, 66, who has been in power since 1990, will center on hard talk on whether the Netanyahu government is ready to extend aid to his campaign against Islamist terror, and in what form: military, logistical or intelligence – on all three battlefronts, or only on a part. Miloš Zeman, the president of the Czech Republic – one of the friendliest countries to Israel in Europe – arrived on Sunday for a four-day state visit. During his visit, Zeman will inaugurate an office in Jerusalem he said will be the precursor to moving the country’s embassy to the city. So your point is that Chad should also move its embassy to Jerusalem? This is just a start. However, all presidents of the unlucky countries under the power of Islam shall rise their voices in a UN General Assembly and ask for pardon and understanding from The Human Civilization, this too long a circus of horror has to stop. Time for an African reality check, to assert control and wrest their destiny from Islamists, the UN, China and the EU elites. I would be looking for trade and other concessions before I entered into agreement with countries that have for generations spit on Israel and let it become the victim of antisemitic attacks by the 3rd-world directed UN. They must stop supporting the Killerstinians/Terrorstinians. There need to be ironclad agreements between Israel and the OIC, African and UN 3rd world to stop using Israel as a kicking post for leftists and Islamists and jealous nations which have thrived on targeting, demonizing and vilifying Jews and Israel – as a way to challenge the West. It is not longer acceptable for developing nations to terrorize and aim to destroy Israel. It has done them no good and so they need to tell China, Russia, OIC countries and leftist multinationals led by people such as Soros that the Africans will join forces with good countries like Israel and not rapacious China, globalists and Islamists who want to take them over and turn them into crap. The agreement Chad-Israel of a peaceful transfer and accommodating the Islamic population temporarily residing in Judea does not require Mahmud Abbas approval, because only the 6 South protectorates move to Chad. it’s not really a diplomatic achievement if israel gets a constant vote against it from these people at every international summit or the UN. it’s time for Israel to demand payback in the form of “no votes ” against these resolutions (and abstentions are not good enough). there have been apparently numerous European terror attacks prevented by Israeli intelligence as well. the next time one of these is about to happen, israel should condition such intelligence on diplomatic support. Chad is France’s last colony , the job of defending it falls squarely on France’s shoulders. Now if Chad wants to buy israeli technology , assistance they have to pay for it , and they have plenty of natural ressources to barter .And the sine qua non first condition of any agreement is a tchadian embassy in Jerusalem and a pro-israel vote at the UN . Africa got Islamic terrorism without Islamic aid as a reward for breaking off relations with the Jewish State. Chad and Sudan and all of Africa must stop the arms shipments going through Africa to the Terrorstinians in Gaza and beyond. The Terrorstinians are the most spoiled, pampered Muslim terrorists in the Islamic world – receiving world aid that on a per capita basis exceeds all other Islamic states. African countries must be very jealous of this terror group that is coddled by the world while African countries starve. Surely these countries understand that Israel is the best “enemy” a terrorist group could have – Israel gives them food, electricity, water, lots of money, plenty of opportunities to kill Jews, a UN infrastructure that could keep 10 African countries afloat with aid and money. Israel must demand that Africa and their European colonizers stop assaulting and harming Israel (in EU and UN) if Israel is to normalize relations with these jew-hating opportunists who decided in the 1970’s to break off relations from Israel because they figured that they’d get more from Islamic countries and to impress Jew-hating OIC countries – but that never worked out too well – they got the Islamic terrorism without the Islamic aid. Perhaps the 1.5 billion Muslims in the world could help instead of a few Israelis. AKA Chad president is looking to increase presence of ISIS. Israeli military intelligence founded Al-Qaeda & ISIS and every shade of so called ‘Islamic extremism’ which has nothing to do with Islam. Just those who are like peas in a pod with Judaism. Asking Israel to help you fight ISIS is like asking the murderer of your wife to host her funeral service. Former Director of Mossad claims “Israel in bed with Al-Nusra, Al-Qaeda, providing them humanitarian assistance.